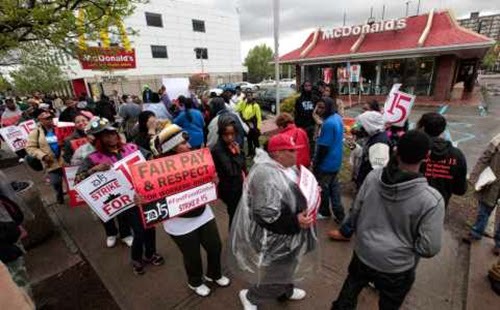 Perhaps due to months of protesting by fast food workers, the minimum wage in 21 states will increase in the year 2015 starting on January 1st. This is the first time ever that a majority of the states have higher minimum wages than the federal level. According to the Economic Policy Institute, the increases will lift the hourly wages of more than two million workers by up to $1 to an average of $8 and a high of $9.15. And according to USA Today, another 1.9 million workers who make more than minimum wage are also expected to benefit from a higher pay scale. Experts say the changes are partly due to the impact of a national movement in 2013 and 2014 to boost the earnings of low-paid workers. The news gets even better! According to EPI and the National Employment Law Project, as soon as March, 29 states with 60% of the U.S. work force will have minimum wages higher than the federal government's. Despite the minimum wage increases at the state level, the federal hourly minimum will be just $7.25. Unfortunately, a bill backed by President Obama, to raise the federal minimum to $10.10 an hour is stalled in Congress amid Republican opposition.